June is Dog License Month! The Month of June is Dog License Month! Are your pups Greenwich-official? The Connecticut State law requires all dogs six months and older to be licensed by June 30. Dog licenses are valid for one year and must be renewed annually via the Town of Greenwich. Last Saturday, June 9, PAWS of Greenwich had the wonderful opportunity to visit Newtown, CT for a very special pet adoption and family festival, which honored the life of slain Sandy Hook student - Catherine Violet Hubbard. The fourth annual Catherine's "Butterfly Party," is held each year, on or around her birthday, and celebrates her passion and love for all animals. 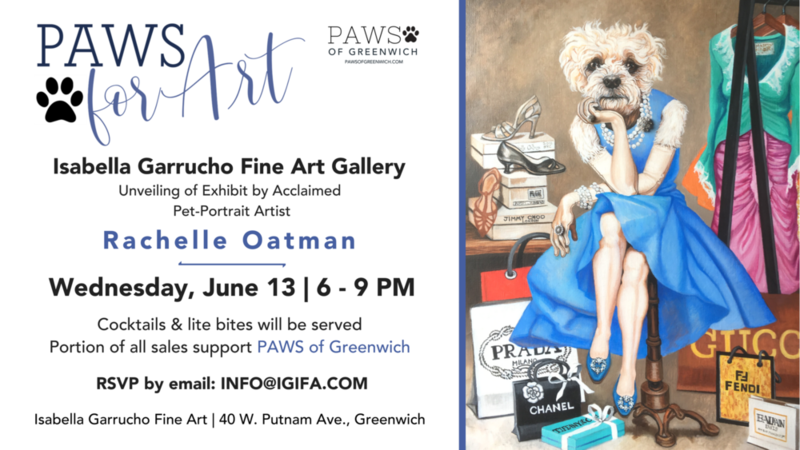 Isabella Garrucho Fine Art Gallery (40 W Putnam Ave.) will debut their newest solo exhibition featuring a collection of anthropomorphic pet portraits by accomplished NYC-based artist, Rachelle Oatman. As part of the month-long, solo exhibition, Isabella Garrucho Gallery will donate a portion of proceeds from all sales to PAWS of Greenwich. To celebrate the opening and partnership, the gallery will host a “PAWS for Art” opening night party on Wednesday, June 13, 6 – 9 PM at the gallery, located at 40W Putnam Ave. Artist Rachelle Oatman will be onsite to speak about her unique anthropomorphic paintings that combine dog portraits on the body of their owners, human body featuring contemporary fashion, haute couture, or historical costume. PAWS of Greenwich volunteers and founder, Jessica DelGuercio will be on site to speak about the importance of pets in our community and the organizations efforts to clean up the dog park, promote responsible pet ownership and more. The partnership will continue later in June, with a PAWS Pop Up Shop at the gallery on Saturday, June 23. Local pet brands and artisans will be on site selling a variety of products. PAWS of Greenwich will also be on site with educational information about responsible pet ownership, pet owner resources and more. A portion of proceeds from all sales will be donated to PAWS of Greenwich. The community is welcome to come out and support all Greenwich PAWS on June 23 at Isabella Garrucho Fine Art Gallery. Rachelle Oatman brings the urban myth that dog owners tend to look like their dogs – to a whole new level - with carefully crafted, manipulated portraits that combine people’s bodies with animal heads – normally dogs. From commissioned paintings that intricately combine a pet with the body and personality of its owner; to unique anthropomorphic characters featuring a portrait of a dog with a body dressed in vibrant fashions - each are intricately detailed to resemble the animal and reflect the personalities of both subjects. “PAWS for Art” event by email: info@igifa.com. Social media influencers, marketing, and public relations professionals partner to raise awareness about the murderous "dog-torture" festival in Yulin. In Yulin, China, June 21, is the start of an annual “festival” when dogs and cats – many of them stolen pets – are brutally beaten to death and then consumed. These animals suffer enormously – packed tightly together in tiny cages and driven for days without food or water to slaughterhouses and markets, before being cruelly killed in front of each other. Last year, Yulin authorities attempted to ban the sale of dog meat, but it was overturned before the festival began. Jessica DelGuercio, founder of PAWS of Greenwich, said there is no longer a push to extend dog season at the beach. However, she said one of her group’s priorities is for more improvements at Grass Island Dog Park. She thanked the department for putting gravel under a section of fence where dogs were getting stuck. However, she said that shards of glass, metal and porcelain continue to bubble up.